The entrance to Earls Court in London on the evening of the 2008 BRIT Awards ceremony. The Brit Awards (sometimes stylised as the BRIT Awards; often simply called the Brits) are the British Phonographic Industry's annual pop music awards. The name was originally a shortened form of "British", "Britain" or "Britannia" (in the early days the awards were sponsored by Britannia Music Club), but subsequently became a backronym for British Record Industry Trusts Show. In addition, an equivalent awards ceremony for classical music, called the Classic Brit Awards, is held each May. Robbie Williams holds the record for the most Brit Awards, 13 as a solo artist and another five as part of Take That. The awards began as an annual event in 1982 under the auspices of the British record industry's trade association, the BPI. In 1989 they were renamed the Brit Awards. MasterCard has been the long-term sponsor of the event. The highest profile music awards ceremony in the UK, the Brit Awards have featured some of the most notable events in British popular culture, such as the final public appearance of Freddie Mercury, the Jarvis Cocker protest against Michael Jackson, and the Union Jack dress worn by Geri Halliwell of the Spice Girls. The Brit Awards were broadcast live until 1989, when Samantha Fox and Mick Fleetwood hosted a widely criticised show in which little went as rehearsed. In subsequent years, the event was recorded and broadcast the following night. From 2007, the Brit Awards reverted to a live broadcast on British television, on 14 February on ITV. In that year, comedian Russell Brand was presenter and three awards were dropped from the ceremony: Best British Rock Act, Best British Urban Act and Best Pop Act. 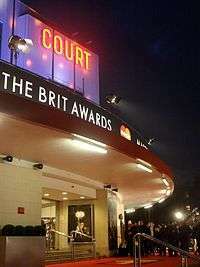 On 18 February 2009, the venue for the BRITs was once again the Earls Court, London. The Brit Awards were held at The O2 in London for the first time in 2011. The Brit Award statuette given to the winners features Britannia, the female personification of Britain. The statuette is regularly redesigned by some of the best known British designers, stylists and artists, including Vivienne Westwood, Damien Hirst, Tracey Emin, Sir Peter Blake and the late Zaha Hadid. The first awards ceremony was in 1977, as "The BRITish Record Industry BRITannia Awards", to mark the Queen's Silver Jubilee and was televised by Thames Television. There have been 36 editions to date. The 2016 BRIT Awards was held on 24 February 2016. (2 awards) No Jacket Required – Phil Collins Tears for Fears – "Everybody Wants to Rule the World" Elton John & Wham! In 1987 the BPI Awards ceremony was held in the Great Room at the Grosvenor House Hotel. At the time there was a BBC electricians' strike in effect, and the organisers decided to use a non-TV events production company, called Upfront, to manage the show. Despite the show being picketed, the event was transmitted as intended. For a while the outdoor broadcast scanner was rocked on its wheels by the protesters and they managed to shut off the power to one of the big GE video screen projectors. Upfront was then asked to organise the following year and persuaded the BPI to move the event to a larger venue, starting the trend that continues to this day, albeit at Earls Court, and with a different production company (MJK Productions). In 1989, the ceremony was broadcast live and presented by Fleetwood Mac's Mick Fleetwood and singer Samantha Fox. The inexperience of the hosts, an ineffective autocue and little preparation combined to create an unprofessional show that was poorly received. The hosts continually got their lines mixed up, a pre-recorded message from Michael Jackson was never transmitted and several star guests arrived late on-stage or at the wrong time, such as Boy George in place of The Four Tops. The 1990 awards ceremony saw the last public appearance of Queen frontman Freddie Mercury. Queen appeared at the ceremony to receive the Brit Award for Outstanding Contribution to British Music. Mercury (who had been suffering from AIDS since 1987 but had not disclosed it to the public) did not make a speech, as Brian May did the talking on behalf of the other members, but his gaunt appearance was noticeable. In 1992, dance/art band The KLF were awarded Best British Group (shared with Simply Red) and were booked to open the show. In an attempt to hijack the event, the duo collaborated with grindcore metal band Extreme Noise Terror to perform a death metal version of the dance song "3 a.m. Eternal" that prompted conductor Sir Georg Solti to walk out in disgust. The performance ended with Bill Drummond firing blanks from a vintage machine gun over the audience and KLF publicist/announcer Scott Piering stating, "Ladies and gentlemen, The KLF have now left the music business", the performance indeed marking the end of the duo's musical career, releasing only several one-off performances and one live performance afterwards. Producers of the show then refused to let a motorcycle courier collect the award on behalf of the band. Later, guests arriving for an after-show party witnessed the band dump a dead sheep outside the venue with the message "I died for you – bon appetit" tied around its waist, whilst their Brit Award was reportedly found buried in a field near Stonehenge in 1993. In 1996, Michael Jackson was given a special Artist of a Generation award. At the ceremony he accompanied his single "Earth Song" with a stage show, culminating with Jackson as a 'Christ-like figure' surrounded by children. Jarvis Cocker, of the band Pulp, mounted the stage in what he would later claim as protest at this portion of the performance. Cocker ran across the stage, lifting his shirt and pointing his (clothed) backside in Jackson's direction. Cocker was subsequently questioned by the police on suspicion of causing injury towards three of the children in Jackson's performance, who were now on stage. In 1998, Danbert Nobacon of politically active band Chumbawamba threw a bucket of iced water over then-Deputy Prime Minister John Prescott. Despite apologies on behalf of the band from EMI Europe, Chumbawamba were unrepentant, claiming "If John Prescott has the nerve to turn up at events like the Brit Awards in a vain attempt to make Labour seem cool and trendy, then he deserves all we can throw at him." In 1999, indie band Belle & Sebastian were nominated for Best British Newcomers, despite having released three albums before the 1999 Awards. The award was sponsored by Radio One and voted for online by their listeners. At the time, Steps were arguably Britain's biggest boy/girl pop group and were also nominated. Despite this, the award was won by Belle & Sebastian. On the Saturday after the awards, a story appeared in the press alleging that the group had rigged the vote in their favour, encouraging students from two universities to vote online. However, fans argued that the band had a predominantly large student following, that band member Isobel Campbell had attended one of the universities in question, and in particular, the award ought to be given on artistic merit as opposed to popularity or CD sales. Dance DJ Brandon Block was told by his friends that he had won an award and had been summoned to the stage to collect it. Because of his advanced state of intoxication he believed them and walked on to the stage, eventually ending up next to a bemused Rolling Stones guitarist Ronnie Wood and actress Thora Birch, who were about to present the award for Best Soundtrack Album. After Block was removed from the stage by security, Wood aimed an insult in his direction. A series of insults were then traded between the two, both of which were audible through the stage microphone, causing claims that the whole event may have been staged. Wood then threw his drink into Block's face, and the DJ was ejected from the event. Some time after the incident, Block claimed that he had subsequently apologised to Wood for his behaviour, and Wood had merely brushed it off. The Spice Girls were set to receive the Outstanding Contribution award at the 2000 Brit awards, reportedly to mark their dominance of the music scene in the past decade. There was much media speculation before and even during the event as to whether or not former Ginger Spice, Geri Halliwell would accept the award with the four remaining members of the group. On the night, however, Halliwell declined to join her former band mates and instead ensured front page coverage the following day by performing her solo number 1 single "Bag It Up" straddling a pole between a pair of giant inflatable legs. Some controversy was caused by the host of the 2007 Awards ceremony, comedian Russell Brand, who made several quips relating to news stories of the time including singer Robbie Williams' entering rehab for addiction to prescription drugs, the Queen's 'naughty bits' and a fatal friendly fire incident involving a British soldier killed by American armed forces in Iraq. ITV received over 300 complaint calls from viewers. He would again instigate controversy the following year at the 2008 MTV Video Music Awards. Adele won the award for 'British Album of the Year', widely regarded as the most important award. Less than half a minute into her acceptance speech, host James Corden was forced to cut Adele off in order to introduce Blur who were due to perform an eleven-minute set as they had won the 'Outstanding Contribution to Music' award and the ceremony was over-running. Adele was visibly annoyed and proceeded to raise her middle finger and the producers of the show came under fire on Twitter for the decision. Following the incident Adele said "I got cut off during my speech for Best Album and I flung the middle finger. But that finger was to the suits at the BRIT Awards, not to my fans". Adele received an apology from the show's organisers, who stated; "We send our deepest apologies to Adele that her big moment was cut short. We don't want this to undermine her incredible achievement in winning our night's biggest award. It tops off what's been an incredible year for her." Due to the tight schedule, only three of the five songs Blur played were broadcast on ITV. At 67 years old, the influential musician David Bowie became the oldest recipient to date of the Best British Male solo artist award. Bowie used his acceptance speech, delivered in his absence by Kate Moss, to urge Scotland to remain part of the UK in the September 2014 Scottish independence referendum. His speech read: "I'm completely delighted to have a Brit for being the best male – but I am, aren't I Kate? Yes. I think it's a great way to end the day. Thank you very, very much and Scotland stay with us." Bowie's unusual intervention in British politics garnered a significant reaction throughout the UK on social media. Ginger Spice, Geri Halliwell, wore a Union Jack dress. Spicemania was at its height in the UK and the Spice Girls had just cracked the US as well, reaching number 1 with their debut single and album. Halliwell was originally going to wear an all-black dress, but she thought it was too boring so her sister sewed on a Union Jack tea-towel, with a 'peace' sign on the back. The now iconic red, white and blue mini-dress was worn during the Spice Girls' performance of their number one song "Who Do You Think You Are". In 1998 she sold her dress in a charity auction to Hard Rock Cafe in Las Vegas for a record £41,320, giving Halliwell the Guinness World Record for the most expensive piece of pop star clothing ever sold. Three years following the iconic Spice Girls performance, Halliwell, now a solo artist, performed her new single "Bag It Up" at the 2000 Brit Awards. The performance featured Halliwell emerging, whilst dancing on with a pole, from a pair of large inflatable female legs. As the performance continued, her male backing dancers stripped to their pinks briefs whilst dancing with the Union Jack flag. It is widely believed that Halliwell lip-synced her performance. In addition to all this, the performance is famous for being performed on the same night that the Spice Girls received the award for Outstanding Contribution for Music, which Halliwell declined to accept with her former bandmates. British reality group, Girls Aloud, marked their first ever performance at the 2009 ceremony, by performing their single "The Promise". The performance saw the members, including Cheryl Cole, Nadine Coyle, Nicola Roberts, Sarah Harding and Kimberley Walsh appear as though they were naked, with their modesty being covered by pink feathers. This performance was nominated in the 2010 ceremony for the "BRITs Hits 30 – Best Live Performance at the BRIT Awards", alongside Oasis and The Who, which the Spice Girls eventually went on to win. Cheryl Cole performed her debut single "Fight for This Love" at the 2010 BRIT Awards. The performance featured two costumes (one in a white trench coat and another in black hooded leotard), and sampled the song "Be" by Rowetta Satchell. The performance was mainly noted for being the first time Cheryl had performed without her wedding ring. At the time of the performance, her marriage with footballer Ashley Cole was rumoured to be over following a second round of allegations of infidelity on behalf of Ashley. Whilst at the time she passed this off as a fashion statement rather than a reflection of her personal life, it was later revealed in Cheryl's autobiography that she had broken off the marriage with Ashley by the performance at the BRITs. Despite allegations of lip-syncing, which was later clarified to be an ITV technical problem in the broadcast of the performance, Cheryl received strong applause from the audience. Following the performance, host Peter Kay commented "Fight for This Love, never a truer word spoken", believed to be in reference to the breakdown of their marriage. Adele performed her song "Someone like You" at the 2011 Brits with only a piano accompanying her. Her emotional performance was received with a standing ovation at the O2 Arena and the video received 450 million views on YouTube. The performance launched "Someone Like You" 46 spots up the UK charts to number one, and in the process, made Adele the first artist in the UK since The Beatles to have two top five singles and two top five albums at the same time. The performance had all lights down and focused on Adele and her piano. Take That have performed the most number of ceremonies, performing seven times. Band member Robbie Williams has performed at six ceremonies, tied for the second most number of appearances alongside Coldplay. Rihanna and Adele have performed at four ceremonies each, and all of four performances took place on the same evening (2008, 2011, 2012 and 2016). "BFI Film & TV Database Search results for 'Brit Awards'". British Film Institute. Retrieved 23 February 2008. ↑ "Dame Zaha Hadid's Brit Awards statuette design unveiled". BBC. 1 December 2016. ↑ "The Brit Awards". BFI. Retrieved 7 September 2012. ↑ These awards were to mark the Queen's Silver Jubilee and were for the previous 25 years of her reign. ↑ "The BRITs 1977". Retrieved 22 September 2013. ↑ Given at a separate show at the London Palladium theatre the previous October. ↑ Given at a separate show at the Troxy theatre the previous November. ↑ "4. The KLF's art terrorism at the Brits 1992". NME. Archived from the original on 17 April 2006. ↑ Gibbons, Fiachra (4 March 2010). "Spice whirl casts shadow over Brit awards". The Guardian. London. Retrieved 27 April 2010. ↑ "Viewers complain over Brits jokes". BBC News. 15 February 2007. Retrieved 23 February 2008. ↑ "Reeves upset by Osbourne Brits rant". Digital Spy. 21 February 2008. ↑ "OK! Magazine: First For Celebrity News :: Latest Celebrity News :: BRITs 2012: Adele gives the finger after James Corden cuts off her acceptance speech". Ok.co.uk. 21 February 2012. ↑ "Blur to play for record time at Brits 2012, says James Corden". Digital Spy. 20 February 2012. ↑ Ellie (19 June 2012). "BRITs 2012: Adele wins Best Album, gets cut off mid-speech. Ouch. | 110% pop". Yahoo!. ↑ Tarley, Rachel. "Adele apologises to fans after flicking middle finger following Brits speech snub". Metro.co.uk. ↑ "News – General – Adele gives the finger at BRIT Awards". 4Music. 21 February 2012. 1 2 "Oldest Brit winner David Bowie enters independence debate". BBC News. 20 February 2014. Retrieved 21 February 2014. ↑ "Brit Awards 2014: David Bowie wins best British male award". BBC News. Retrieved 22 September 2014. ↑ "David Bowie on Scottish independence: Reactions on Twitter". The Independent. London, UK. 20 February 2014. Retrieved 21 February 2014. ↑ "Iconic Union Jack dress". The Sun. UK. 15 December 2007. Retrieved 11 February 2012. ↑ Alexander, Hilary (19 May 2010). "Online poll announces the top ten most iconic dresses of the past fifty years – Telegraph". fashion.telegraph.co.uk. Retrieved 3 February 2015. ↑ "Pop World Records, Music World Records, Record Breaking Achievements". Philbrodieband.com. ↑ "Brit Awards 2010: all eyes on Cheryl Cole". The Telegraph. ↑ "Brit Awards 2010: Cheryl Cole jets off to LA after feisty Brits performance (but what's that ring on her wedding finger?)". Mail Online. ↑ "Kanye West Replaces Rihanna As 2015 BRIT Awards Performer". Music News, Reviews, and Gossip on Idolator.com. ↑ "Kanye West's Brits performance muted constantly". ITV News. ↑ "Madonna To Perform at BRIT Awards". Billboard. 1 2 "Madonna 'suffered whiplash' after Brits fall" (27 February 2015). BBC. 27 February 2015. ↑ "And the Nominees Are...". Brit Awards 2016. Retrieved 2016-10-02. ↑ "Brit Awards: Did you know...?". BBC News. Retrieved 27 September 2014. 1 2 "Weekly Top 30 Programmes". Broadcasters' Audience Research Board. Retrieved 19 February 2014.